Want to save the world’s most imperiled biodiversity hotspot? You just need a down payment of $198 million. While that may sound like a lot, it’s actually less than it cost to make the film, Titanic. A new study published today in Science finds that paying private landowners to protect the almost-vanished Atlantic Forest would cost Brazil just 6.5 percent of what it currently spends ever year on agricultural subsidies. When Europeans first arrived in Brazil they found a vast forest stretching along the entire eastern coast, full of species found nowhere else: this was the Atlantic Forest or Mata Atlântica. Today, this once-great forest is a shadow of it’s former self. Only around 6-10 percent of the original forest is left, including patches in Paraguay, Uruguay, and Argentina. But even this hides a worse truth: a recent study in Biological Conservation estimated that the Atlantic Forest retains only 3.5 percent of its primary vegetation, making it arguably the most degraded biodiversity hotspot on the planet. The green-headed Tanager (Tangara seledon) is one of the most colorful birds in forests of Southeastern Brazil. It is listed as Least Concern by the IUCN Red List. Photo by: Sandro Von Matter. “Our study shows that it would be relatively cheap to secure the future of the forest—and protect its plants, birds and other animals—by paying land owners on a large scale to set aside land for conservation,” explained lead author of the Science paper, Cristina Banks-Leite, from the Department of Life Sciences at Imperial College London. Looking at mammals, birds, and amphibians, the scientists estimated that to maintain these family groups they would need to keep 30 percent of the forest. This means not only protecting the forest that is left, but significantly restoring lost forest. Less than 200 blonde capuchins are believed to survive. 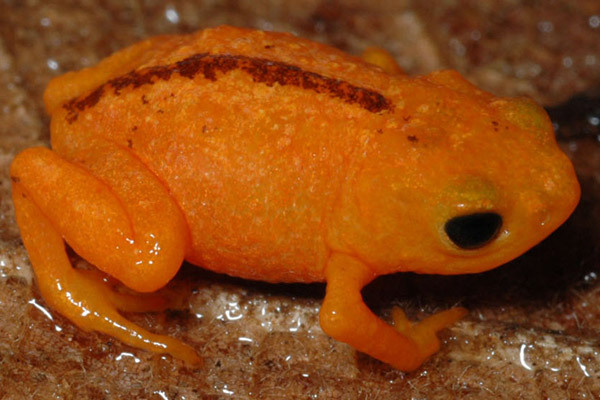 They are only found in the Atlantic Forest. Photo by: Miguelrangeljr/Creative Commons 3.0. The scientist propose that this could be achieved by paying landowners to set aside and restore private lands, in a scheme generally known as payments for ecosystem services or PES. To achieve this 30 percent target in priority landscapes—both through protection and restoration—would cost $198 million a year for the first three years or 0.0092 percent of Brazil’s current GDP, according to the paper. Moreover, after three years the cost would drop significantly. “Local communities and land-owners will benefit not only from regular payments but also from the benefits that a flourishing ecosystem brings. We need to start to put such a scheme in place now, before it becomes too late,” said Banks-Leite. There are already some PES programs going on in the region, but the authors write that these are “relatively local initiatives that do not match the extensive scale of conservation needs and societal issues.” In other words, if the Atlantic Forest is to remain a viable ecosystem, a much broader and bigger effort will be required. “Creating set-asides to restore priority landscapes back to 30 percent forest cover may not save the most threatened species from extinction, but it would increase biodiversity and the ecological functions that species provide across rural areas (e.g., pest control and pollination) to a level similar to what is observed in protected areas,” the researchers write. But would such set aside hurt agricultural output in the area? Not significantly. The scientists estimate that agricultural GDP would decline by less than one percent in the targeted areas. Moreover, farmers would see added benefits from a better-functioning ecosystem. “Only rarely are the trade-offs between ecological gains and economic costs this simple,” the authors write. The Ihering’s three-striped opossum (Monodelphis iheringi) is endemic to the Atlantic Forest and weighs an average of just 11 grams. It is listed as Data Deficient, meaning scientists don’t know enough to about the species to know if its imperiled. Photo by: Thomas Püttker. 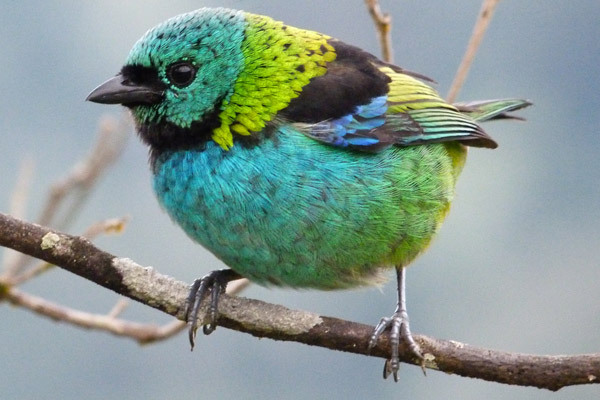 Despite being almost wiped out, the Atlantic Forest still maintains thousands of species found no-where else. Scientists have catalogued over 23,000 plants, 40 percent of which are found only this forest. 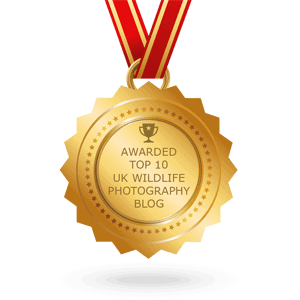 Moreover, surveys have found over 260 mammals, 350 freshwater fish, 750 amphibians and reptiles, and almost 1,000 birds. 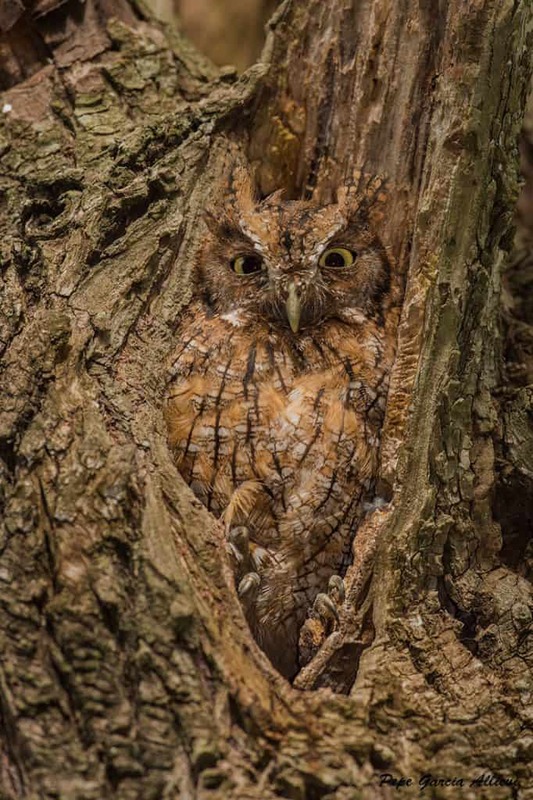 Approximately 30 percent of these animals are found no-where else or about 700 species. “The Atlantic Forest is smaller and far more degraded than the Amazon rainforest, but it is also contains a vast range of biological diversity,” said Banks-Leite. New species continue to be found in the region as well, including mammals. Just last year researchers announced a new porcupine and a new cat species. Other species-long believed lost have also been rediscovered, including the Critically Endangered blonde capuchin (Cebus flavius). 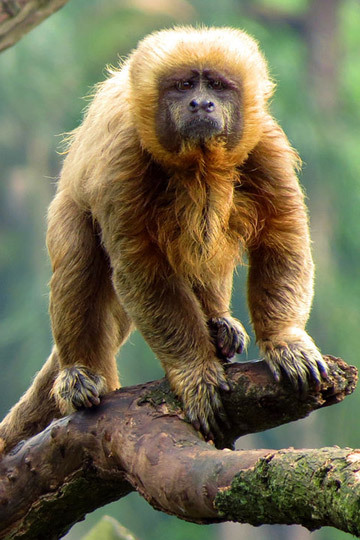 A golden-colored monkey not recorded since the 18th Century, the species was re-discovered in 2006. Less than 200 are believed to survive, but the Sao Paulo Zoo is currently working to breed a few individuals of the species in captivity. Portions of the Atlantic Forest are still home to megafauna such as jaguars and tapirs, however these populations are suffering greatly under forest fragmentation. While researchers admit the forest will never be what it once was, it could still be safeguarded and expanded—and most of its species protected—with just a little investment. 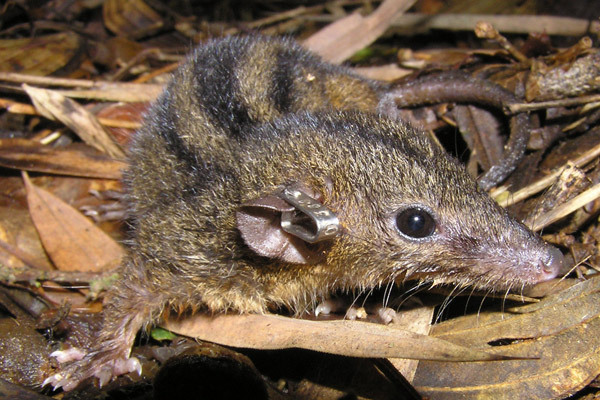 Brachycephalus guarani was just discovered in 2012. It is endemic to the Serra do Mar mountain range in the Atlantic Forest. Individuals are smaller than 2 millimeters. It hasn’t been evaluated by the IUCN Red List yet. Photo by: Thais H. Condez. 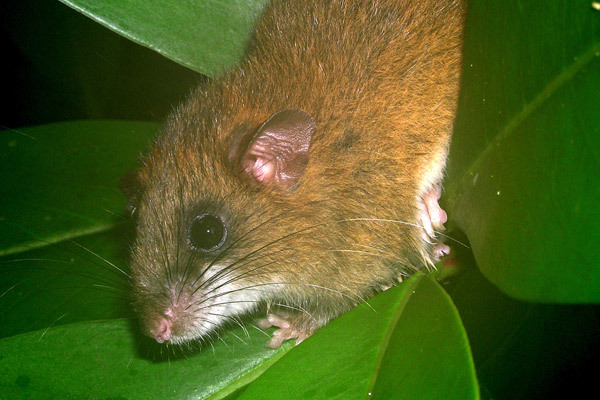 The black-spined Atlantic tree-rat (Phyllomys nigrispinus) is endemic to the Atlantic Forest. It is not considered threatened. Photo by: Thomas Püttker. 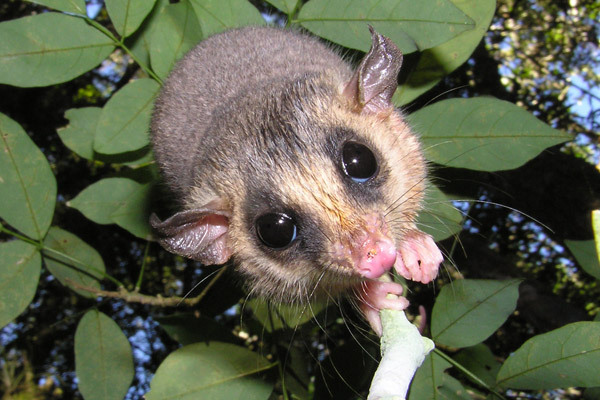 The Brazilian gracile opossum (Gracilinanus microtarsus) is a marsupial endemic to the Atlantic Forest, but is also not threatened. Photo by: Thomas Püttker. 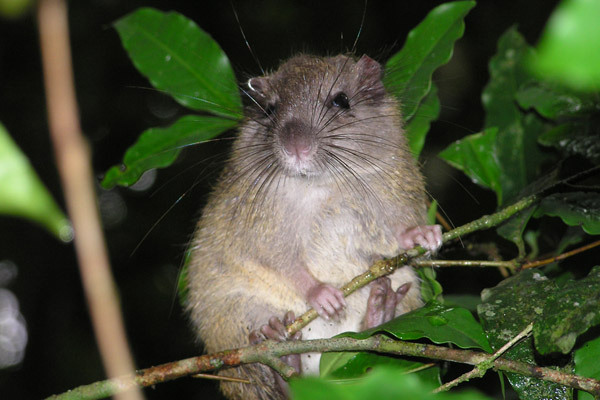 Only found in the Atlantic Forest, the montane forest rat (Drymoreomys albimaculatus) was just described in 2011. It is the only member of its genus and has yet to be evaluated by the IUCN Red List. Photo by: Thomas Püttker. 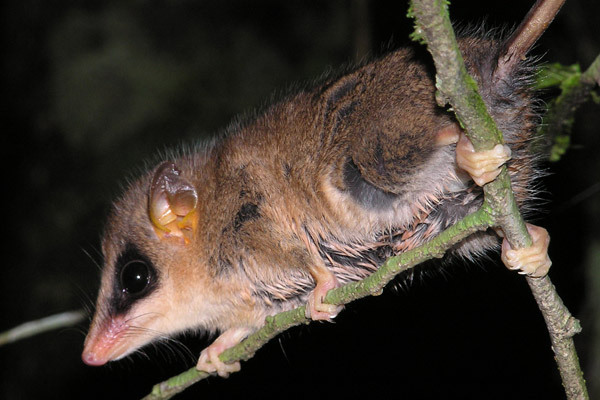 The Tate’s woolly mouse opossum (Micoureus paraguayanus) is mostly endemic to the Atlantic Forest. It is not threatened. Photo by: Thomas Püttker. Sloan, S., Jenkins, C.N., Joppa, L.N, Gaveau, D.L.A., Laurance, W.F. 2014. Remaining natural vegetation in the global biodiversity hotspots. Biological Conservation. 177: 12-24.